Here in the United States, if you decided to keep your horse in your living room, the authorities would come and put a stop to it. Legislation and regulation has a far reach in the land of the free and the home of the brave. When it comes to freedom, I’m beginning to prefer the Western Isles of Scotland. 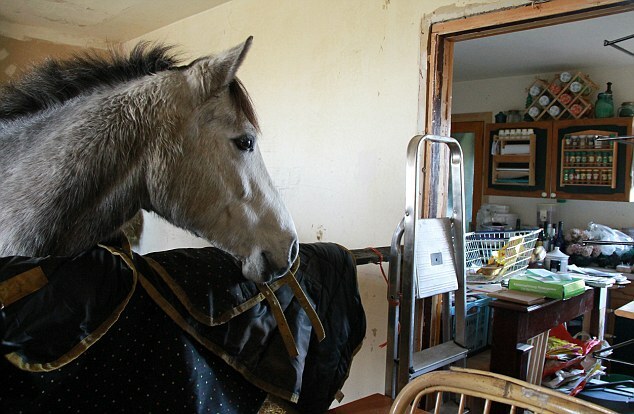 And in terms of bravery, there’s one Stephanie Noble, who despite being declared “a fruitcake” by her neighbors, is still bravely caring for her Connemara filly, Grey Lady Too, inside her home. Does this look like an unhappy horse to you? For true horse lovers, that’s all that matters, isn’t it? The Scottish SPCA has investigated the case, and their inspector declared that “it [the horse] does appear to be in good condition and well cared for.” A spokesman for the Western Isles Council announced that Noble was free to do as she pleased in her own property provided that public safety or hygiene were not affected. Before you conclude that Noble has no idea what she’s doing when it comes to horses, you should know that she is a British Horse Society instructor. She lived in the US until 1994 and has run equestrian businesses here as well as in Ireland and Europe. Her latest horse is named after her first pony, Grey Lady. Noble’s horse was originally kept in stables nearby, but after more than one dispute, Noble found her horse, last Christmas Eve, tethered to her porch. As she said, “I was faced with the choice of leaving her out in the cold or bringing her indoors, and I chose to bring her in.” Lots of people say “the horse comes first,” but few do as they say. Noble may be one of them. She’d like to find suitable grazing for her horse, but for now, Grey Lady goes on to the front lawn. I have to say that I’ve considered tethering a horse to my own front lawn before, after seeing some of what goes on in commercial stables. Noble’s filly also has some grass to eat, which is more than you can say for most of the “”pampered” pet horses close to metropolitan areas. I’d imagine if you asked Grey Lady, she’d say that she’s pretty happy. She has Noble’s cat as a companion. I’ll admit that Noble has her work cut out for her, as she has yet to break in her horse, accustom it to a normal horse life, and deal with stable chores inside her house. But I wouldn’t be surprised if Gray Lady has to inhale less ammonia every morning than any of 30 or 40 show horses in a fancy center aisle barn that’s closed up tight on a winter night here in the Northeast. From the looks of it, she’s not a housekeeper who would make Martha proud, but neither are a lot of horse people, including me. I fly the banner “My horse is cleaner than my house,” and I know I’m not alone. A little dust and disorder is fine. What I can’t stand is a paddock that hasn’t been picked, even for a day. I wouldn’t be surprised to discover that Stephanie Noble and I have that in common. Not much different from the Yankee farmers who attached their barns to their houses in order to care for their animals during our rough winters, where the snow could block access to their barns in the days before tractors and bucket loaders. You can still find many standing examples in New England. Personally, years ago at our previous farm in Newtown, I had my baby goat Gruff in the kitchen for an extended stay. One night,In the middle of winter, he got out of his stall and found his way into my field hunter’s stall and got taken for a goat cookie. He had 4 broken vertebrae. He was a good house guest until I took pity on him and left the radio on for company before I went to work. Being the ever inquisitve boy, he broke out of his pen wandered all around the house, leaving goat droppings as he went, peed on the oriental rug and chewed all of my silk plants! Oh Elaine, thanks for another great story. I’m so sorry to hear about your goat. I live in one of those New England houses you talk about, with an attached barn and there was straw on the floor when I moved in. No way would my husband ever go for that. We looked at one house that was really just an apartment over an aisle of stalls. He nixed that one immediately. I think my horses would prefer living outside anyway.